I’ve had this skirt in mind for a while but took my time in making it up. It’s a fairly basic skirt, but is nicely out of line with the big round circle skirts I usually make. Having finished watching Mad Men a little while ago, I decided I was sorely lacking in the cute 60’s skirt department. I made this up with a left over remnant of thrifted vintage rosey pink wool and I used up almost every single last scrap. It’s lined with a bubblegum pink lining and does up the back with a zip and hook (and as usual with most of my sewing, I moved the zip from the side to the back. My hips do not need any extra bulk thank you very much!). 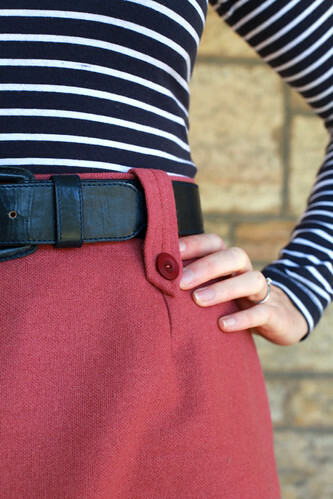 Because it’s such a plain skirt, I thought I needed a cute detail and so found some cute buttons, made up some belt loops and then went about experimenting with different ways of designing them. I ended up hand sewing them together with a triangle pivot at the bottom – I really like how they turned out and think they add a nice little detail. I’m calling it the last winter skirt because it’s basically Spring now and there is the potential I won’t get to wear it much in a few weeks time. But I think it would look cute paired with the sleeveless jasmine blouse I made in autumn this year. How do you perk up a relatively plain garment when you are sewing? The fabric is great! Love the extra touch of the buttons. Oohh it looks lovely! The button loops are an amazing detail! What a great way to add a little something special! Very pretty and neatly done! 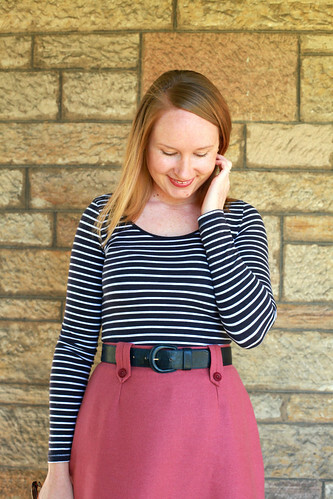 I think it will be a cheery skirt any time of the year, and the color suits you! Looks great! I love the belt loops, excellent idea. Very nice! I like to use bright colors, pockets and small details (like your buttons and tabs) to perk up any “plain” projects I’m working on.